VCs and entrepreneurs continue to be impacted by new foreign investment scrutiny. In August, the Foreign Investment Risk Review Modernization Act (FIRRMA) delivered enhanced powers to the Committee on Foreign Investment in the U.S. (CFIUS), a U.S. government entity that has been called the “ultimate regulatory bazooka” for its ability to reject foreign investment for national security reasons. Recently, NVCA members and startups heard from CFIUS leaders at our Emerging Technology Meets National Security conference. 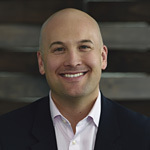 That included the Treasury Department’s Heath Tarbert, who leads FIRRMA implementation and has a major role in how the new powers will impact the venture industry going forward. Tarbert’s fireside chat helped attendees understand how the Treasury Department—which chairs CFIUS—is thinking about its new authorities. Tarbert began his talk by noting that FIRRMA recognizes that typical venture capital funds are outside the CFIUS process. Tarbert was referring to FIRRMA’s recognition that passive investment, whether into venture funds as LPs or directly into startups, is not captured by the new regime. 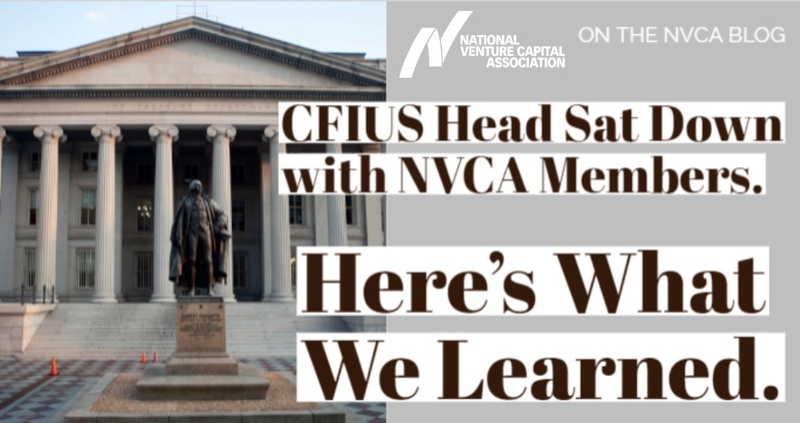 The final FIRRMA product reflects considerable effort and resources from NVCA to get the law in a place where many venture funds will not need to file with CFIUS. But understand this: everyone should be cognizant of CFIUS’s new relevance in the startup ecosystem. CFIUS is moving from a world in which it mostly looked at situations where a foreign entity was buying an entire company to a new world that also includes minority, non-controlling investments. Tarbert recognized that the minority investments done by VCs operate on quick timelines. He shared his belief that the new “declaration” process established in FIRRMA would be useful to the venture industry. What this means for you: Under this new process, a 5-page declaration could be used that must be acted on within 30 days to get clearance for the transaction. This can be contrasted with the longer “notice” process that has been used historically. Tarbert discussed the new FIRRMA pilot rules, which went into effect on October 10 and established mandatory filings beginning on November 10 (my analysis here). The pilot rules put in force some of the new authorities granted to CFIUS. He encouraged the venture industry to continue to engage with the Treasury Department, and specifically encouraged questions through their website. Tarbert said his hope was questions could be answered through the FAQ section. NVCA recently submitted formal comments in the pilot program proceeding. Further guidance on the meaning of “material nonpublic technical information,” which is important because this is one of the prohibited items that can trigger CFIUS jurisdiction if this information passes to a foreign person. Currently, there is not much guidance about what this term means. The impact of a direct investment by a foreign LP into the portfolio company of a venture fund. FIRRMA nor the pilot rules specify the CFIUS filing obligations of a venture fund if a foreign LP makes a direct investment that gives the foreign LP any of the prohibited rights. Whether CFIUS will treat a fund controlled by U.S. persons that is organized under foreign law as a foreign entity. Current CFIUS regulations exclude from the definition of “foreign entity” an entity that is organized under foreign law if it neither has a principal place of business outside the U.S. nor is traded on a foreign exchange. Clarification that a general partnership that is majority owned by U.S. nationals will not, by virtue of a minority foreign stake in the general partnership, yield a determination that the fund itself is under foreign control. Let’s talk timeline: The pilot program rules issued on October 10 will be in effect until they are replaced with final rules, and these final rules could come as late as early 2020. Tarbert stated he does not envision changes to the pilot program at this time but did not want to foreclose the possibility. He was asked whether the public should expect additional pilot rules before the notice of proposed rulemaking (NPRM) for the final rule. Tarbert replied it was possible, but it is important to understand the resources of Treasury Department before going down that road. Tarbert went on to note that CFIUS received additional resources in FIRRMA and was staffing up for additional notices and declarations. He explained that the pilot program is a way to grab a small portion of the possible transactions to evaluate investment patters and structures utilized. NVCA will remain deeply engaged in this issue to avoid unnecessary harm to startup investment from U.S. allies. Tarbert explained the Treasury team that worked on the pilot rules has now turned to working on the NPRM for the final rule. He expects the NPRM to be released sometime in 2019, and he expressed they are undecided on whether the NPRM will be released as one package or in multiple tranches. Pay attention here: The final rule process will be critically important for NVCA. Because FIRRMA provided significant discretion to CFIUS, the rulemaking is an opportunity to set key practices and define key terms. The fireside chat was illuminating and helpful to understand what comes next on FIRRMA. It was a great example NVCA’s ability to convene top policymakers, VCs, and startups for a dynamic and candid dialogue. Look for more updates from NVCA on FIRRMA and related issues in the coming weeks and months. But most of all, stay engaged with us on this and other policy issues impacting VCs and startups.